Tulamben Bay’s house reef, commonly referred to as “Coral Garden” is a great place for new divers to practise their skills, plus there is an excellent artificial reef which plays home to many of Tulamben’s most interesting residents. Running for approximately 150m along the middle section of Tulamben beach is a shallow reef. 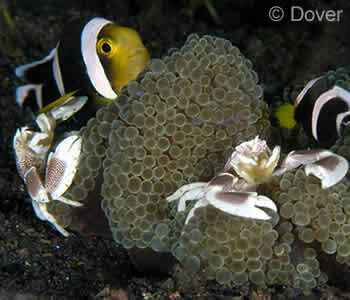 The Coral Garden depths are from 3 to 8-12m. This makes it a great site for extended Night Dives and snorkelling. The fish life, as with the Drop-Off and the USAT Liberty Shipwreck, is very diverse with a surprising number of Blue ribbon eels (the juveniles of which are black), cuttlefish and octopus. 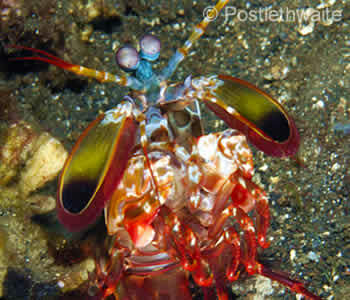 There is wide variety of shrimps including Peacock mantis shrimps. You may also find frogfish, ghostpipefish, nudibranch and anemonefish. Black-tip reef sharks patrol up and down, and you may well see Giant groupers and the school of Bumphead parrotfish too. In fact, the Coral Garden actually extends much deeper than 12m. If you carry on down the sand slope, you’ll find barrel sponges with many surprises. You may find juvenile Emperor Angelfish, Two-spot lionfish, maybe a school of juvenile catfish; cleaning stations with shrimp and wrasse, or a shoal of razorfish swaying in their hiding place. If you follow the slope towards the Drop-Off, you’ll come to Tulamben’s River Bed. Although not an area for divers looking for a profusion of marinelife, it is often the best place in Tulamben Bay to find unexpected specimens! The depth and location make Tulamben Bay’s Coral Garden a very good and popular Night Dive on which you may see Spanish dancers and other nocturnal hunters and feeders. Book Your Bali Diving - Coral Garden Today!